Researching mining stocks can be like a jungle safari where you might find a few monsters, elephants, gorillas, bears and tigers—or at least that's how I describe the size and upside of certain undeveloped deposits. Now that share prices of the major gold producers may have signaled the turn, I am focusing more on these higher alpha plays. Share prices for the five developers detailed below were so low until recently because they had little economic value other than as a highly leveraged bet on potential future cash flows tied to higher metals prices—like a call option with no set expiry date. The other big hurdle is their very large CapEx costs of hundreds of millions to billions to get their mines permitted and built. Even if we are in a gold bull market and this capital becomes available, shareholders still have to worry how much future financings will cost in equity dilution via share issuances, debt, streaming transactions, net smelter return and other royalties, and/or joint ventures (JVs). I like that insiders own sizeable stakes in these companies, with still tight share structures due to good foresight in selling stock at high prices—unlike other miners who must think they are running their own central bank by the massive amounts of cheap paper they have issued at recent lows. Developers still need government approvals to advance and de-risk their projects. Permits are seen as critical value multipliers by investors, analysts, lenders, and especially bigger-fish mining companies always on the lookout for workable acquisitions. Also keep in mind that resources in the ground do not always translate into equal amounts of recoverable production and that while these stocks may still be cheap, like most gold stocks they have already doubled or more since their January lows—even this precious metals bull thinks we may be due for a sharp although short-lived correction. To be fair all miners have to deal with warts of some kind, bringing me back to the point of this article in highlighting precious metals stocks with some of the world's largest undeveloped resources which offer huge potential leverage to higher gold and silver prices. The last developer below is also highly leveraged to metal prices and is my favourite silver play right now as it still has cheap, tight, under followed shares, with strong financials and mine economics which work today—at a very low CapEx. (AMEX:XRA)(TSX:XRC) Exeter Resource is listed on the NYSE MKT and TSX with a 2010 high of US$9.41, now trading at US$0.87 per share. The most recent XRC equity raise I can find was in late 2010 for C$57.5M at C$6.20 per share. This Canadian exploration company plans to develop its world-class Caspiche gold-copper project in Chile—between (NYSE:KGC)(TSX:K) Kinross Gold's Maricunga mine and (NYSE:ABX)(TSX:ABX) Barrick Gold and KGC's Cerro Casale deposit. Exeter's website shows Caspiche's Measured & Indicated (M&I) resources of 1.7Moz gold equivalent (AuEq) oxides and 37.9Moz-AuEq sulphides. Past pre-feasibility development scenarios envisioned a super-pit producing oxide and sulphide ores together at ~696Koz-Au, ~244Mlbs-Cu and ~844Koz-Ag per year over 19-years. The problem was the US$4.6 billion price tag to build it, and as metals prices fell this mine plan became unfinanceable and likely uneconomic under US$1,300/oz gold. Today sees multiple scalable options from ~US$250M for a 30K tpd heap leach operation producing 122Koz AuEq per year over 10-years, to ~US$2B for a 60K tpd underground mine producing 344Koz AuEq per year over 42-years. Scenarios include sustaining and closure costs for standalone to staged mine plans, starting with a lower cost mine to produce the near surface gold oxides, which can pay for most of the later development of the longer-term deep core with higher-grade gold-copper sulphides. Exeter's April presentation also shows C$21M (US$16M) in cash on hand and no debt. At US$0.87 per share, XRA's US$77M market cap minus this cash equals US$61M, divided by 39.6Moz-AuEq works out to M&I resources in the ground at ~US$1.54 per ounce—under $2 an ounce gold! 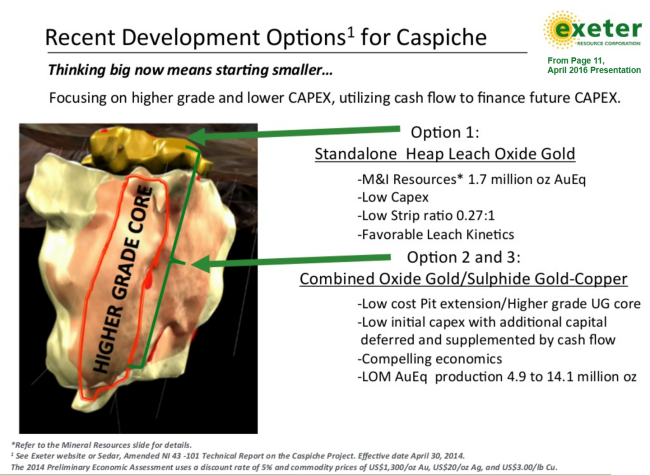 As Caspiche is next to Cerro Casale, this reminds me of buying Arizona Star Resources in the mid 1990's between $1 and $2, later sold over $10 before topping at around $17 per share. Arizona Star owned 51% of the JV (Bema Gold had 49%) which discovered 23Moz-Au and 6Blbs-Cu. Cerro Casale's CapEx was ~US$2B with grades of only 0.69 g/t gold and 0.26% copper. A few years later as gold fell from over US$400 to under US$300 I remember seeing Arizona Star at around C$0.50 per share and thinking all that gold and copper is still there. Fast forward to 2008 as gold hits US$800 an ounce when ABX purchased the company for C$773M or C$18 per share just for its 51% of a large but costly low grade deposit. Perhaps like Exeter's Caspiche bet, higher gold prices alone drove the value of the Cerro Casale JV from tens of millions to over C$1.5 billion. KGC earlier had paid US$3.2B for Bema Gold, leading to today's US$2B (AMEX:BTG)(TSX:BTO) B2Gold which was detailed in my latest newsletter. Few 20Moz+ monster deposits like Caspiche and Cerro Casale are being found these days which especially make them prizes worth the majors fighting over at higher gold prices. You can see the leveraged value offered by developers with large, lower grade deposits which the market still deeply discounts—here are a few more of the biggest plays. (TSXV:CKG)(OTCBB:CHPGF) Chesapeake Gold is listed on the TSX Venture Exchange and OTCQX with a 2011 high of C$18.80, now trading at C$3.45 per share. The most recent CKG equity issue I can find was a warrant exercise early in 2012 of C$35.24M at C$8.00 per share. This Canadian explorer plans to develop its world-class Metates gold-silver-zinc project in Durango State, Mexico. CKG's March 7 updated pre-feasibility study (PFS) shows Proven & Probable (P&P) reserves of 18.3Moz-Au, 502Moz-Ag and 4Blbs-Zn. Chesapeake, like Exeter, also plans to now do a phased mine development at 30K tpd for 4-years and then up to 90K tpd until year 27 funded from internal cash flows, followed by ten more years processing the stockpiled ore. The highest grades will be mined first at a very low strip ratio, with low energy costs and near key existing infrastructure. Highlights of the PFS are Phase 1 CapEx of US$1.9B (includes US$244M contingency), with gold cash costs of US$339-US$346/oz over the first 10-years for annual production of ~146Koz-Au, 14Moz-Ag and 115Mlbs-Zn. Phase 2 CapEx is US$1.59B (includes US$253M contingency) for 700Koz-Au per year over 10-years starting in year five, with life of mine all-in sustaining costs (AISC) of $662/oz. The base case pre-tax net present value (NPV) is US$1.78B at a 5% discount rate and the after-tax NPV is US$737M, compared to CKG's market cap of only C$153M (US$124M). CKG has C$24M (US$19M) in cash and marketable securities with no debt. At C$3.45 (US$2.79) per share, if you subtract the cash from the market cap and divide this US$105M by 18.3Moz-Au it equals ~US$5.74/oz for higher confidence P&P gold reserves, and on an AuEq basis it is even lower after you factor in all the silver and zinc. My focus is on precious metals, but four billion pounds is a lot of zinc with higher prices expected as record shortages widen into 2017—Ireland's Lisheen mine and Australia's Century mine are now closed. 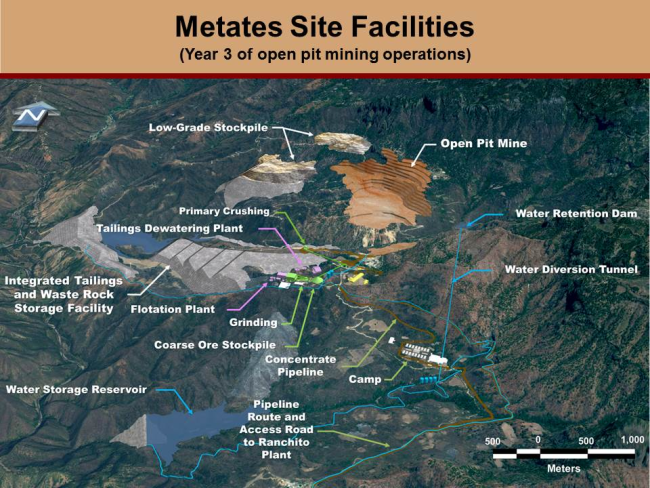 Also from the PFS, "Metates is unique in that building either a large or smaller initial mine, the project is economically viable at current metal prices." (TSX:NDM)(AMEX:NAK) Northern Dynasty Minerals is listed on the TSX and NYSE MKT with a 2011 high of C$21.50, now trading at C$0.45 per share. The most recent NDM equity raise I can find was last year for C$5.2M at C$0.412 per share. This Canadian exploration company plans to develop its world-class Pebble copper-gold-molybdenum-silver project in southwest Alaska, USA. NDM describes Pebble as comprising one of the world's greatest stores of mineral wealth. On first glance I had assumed this was a typical exaggeration—boy was I wrong. NDM's fact sheet shows M&I resources of 57Blbs-Cu, 70Moz-Au, 3.4Blbs-Mo and 344Moz-Ag, and Inferred resources of 24.5Blbs-Cu, 37Moz-Au, 2.2Blbs-Mo and 170Moz-Ag. 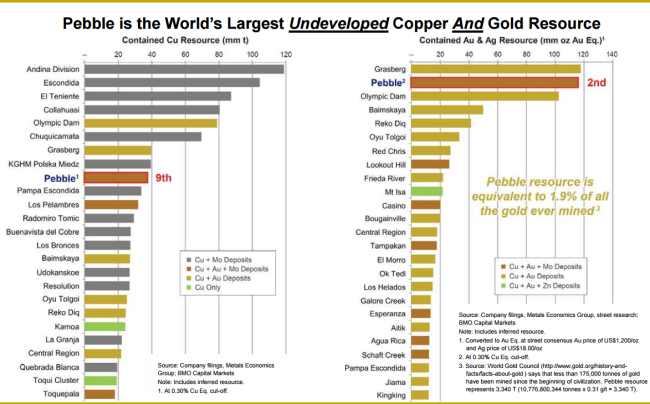 Below is from NDM's March presentation which ranks Pebble as the world's largest undeveloped copper deposit AND largest undeveloped gold deposit. If running today it would be the world's 9th largest copper mine and 2nd largest gold mine. NDM's December balance sheet shows ~C$9M in cash and marketable securities with no debt. At C$0.45 per share, if you subtract this cash from the C$100M market cap and divide this C$91M (US$70M) by 107Moz-Au it equals ~US$0.65/oz—under a buck an ounce gold! NDM's copper is worth more than its gold and if divided by 81.5Blbs-Cu (81,500Mlbs) it equals ~US$0.00086/lb—9/100th of a cent per pound copper! You can also work out the separate in the ground moly and silver values, but I could not find the cheaper and more meaningful AuEq or CuEq combined resources. NDM's C$100M market cap is not only cheap compared to its ginormous resources, and the C$155M showing in shareholders equity, but also when considering the $750M spent advancing the project. Most of this, US$573M, came from Anglo American between July 2007 and December 2013. Anglo withdrew from the 50:50 JV and now NDM owns 100% of Pebble's mega-deposit, which it wants to develop into a modern, large-scale, long-life, open-pit or high-volume underground mine, or both. Why so cheap you say? Some doubt if NDM can meet the above project status timeline with a mine producing in 2024. This year's catalysts are various studies and economic assessments from pre-feasibility to environmental and socio-economic. The permitting process shows as starting this year with approval in 2020—remember I mentioned how permits are seen as critical value multipliers. Sockeye! No I didn't sneeze I meant red sockeye salmon north of Bristol Bay and Iliamna Lake. The watershed around the world's largest copper and gold resources contain the world's largest spawning grounds, biggest runs, best sport fishing and half the commercial supply of wild sockeye salmon. Minimizing environmental disturbance with a comprehensive mine reclamation plan are key steps to getting the EPA's nod during the permitting process. Feedback and change requests are not unusual but Pebble's development has received serious pushback from conservationists, fishermen, tribal groups, national environmental groups, Hollywood celebrities, wealthy activists to the White House. Alaska is earthquake prone and my understanding is that NDM needs to convince the EPA how its leach pads and dams will not fail (which contain the mine's vast amounts of waste rock) and will not leak copper which can affect how salmon smell and find each other to migrate and breed. So is NDM a bet on mine technology, political change, recession and needed mining jobs, or legal challenges? (AMEX:THM)(TSX:ITH) International Tower Hill Mines is listed on the NYSE MKT and TSX with a 2011 high of US$10.49, now trading at US$0.64 per share. The most recent ITH equity raise I can find was in late 2014 for C$8.4M at C$0.46 per share. This advanced stage Canadian explorer plans to develop its world-class Livengood gold project located 70 miles northwest of Fairbanks Alaska, USA. M&I gold resources are shown as 15.7Moz at 0.61 g/t and 4.4Moz at 0.52 g/t Inferred. The company's mine plan is to produce ~578K ounces per year over 14-years, with almost 700K ounces per year in the first five years. THM's US$75M market cap, less its cash, implies a gold value of ~US$3.48/oz. Scanning the 2013 technical report, total costs are close to $3B (plus sustaining capital of around another $B) based on US$1,500 gold, with a longer 10.8 year payback, low 1.7% IRR and a negative NPV of -$440M. The price sensitivity table does not show a positive NPV until US$1,700 gold, but at US$1,900 gold it is $1.1B. The bet is will higher gold prices again morph a negative value asset into a billion, and carry THM from today's $0.64 per share ($0.18 low in January) closer to its 2011 highs? 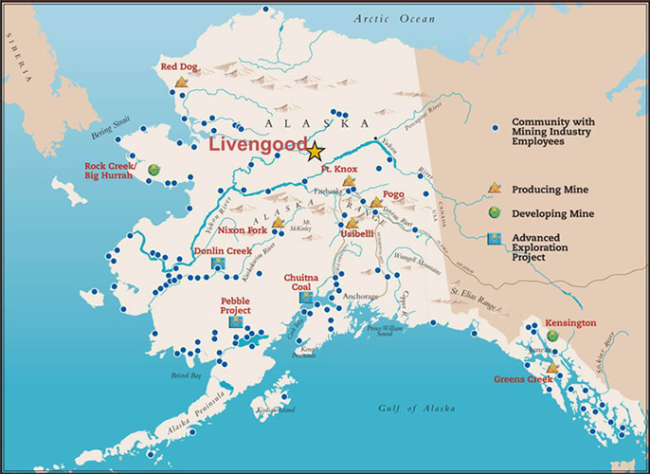 Livengood is in a less enviro-touchy area of Alaska, surrounded by mines, which should make for a much easier go at permitting some day. I can wait for a 20Moz lower grade optionality play as long as it does not need to dilute just to survive until gold prices are flying again. THM has strong backers (Paulson & Co. hold 19.8%, Tocqueville 19.7%, AngloGold Ashanti 9.5%) and had over US$50M in cash four years ago with no debt, however the May 6 Q1 shows only US$5.1M in cash with a working capital deficit now up to US$9.9M. (TSX:MSV)(OTCBB:MISVF) Minco Silver is listed on the TSX and OTCQX with a 2010 high of C$7.14, now trading at C$1.22 per share. The most recent MSV equity raise I can find was in early 2011 for C$45.22M at C$5.95 per share. This Canadian silver company has two development assets along the Fuwan Silver Belt in Guangdong, China. MSV's flagship resource continues to be 90% of the Fuwan Silver Deposit, and last summer it purchased (TSX:MMM)(AMEX:MGH) Minco Gold's 51% interest in the Changkeng Gold Project—located right beside the Fuwan silver deposit. MSV describes the Fuwan Silver Project as exceptional to develop with nearby infrastructure including immediate access to roads, rail, power, water, and skilled labour, which provide much lower capital costs versus comparable projects globally. 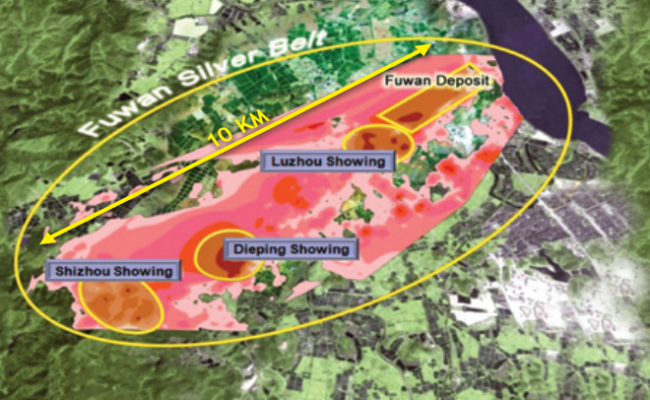 The company's website shows Fuwan's silver resources in ounces of 55.3M Probable Reserves at 189 g/t, 93.5M Indicated at 182 g/t and 63.3M Inferred at 174 g/t, with only 2.8 km of the 10 km strike length having been explored. MMM's website shows Changkeng's gold resources (now 51% owned by MSV) of ~623Koz at 4.89 g/t Indicated and ~387Koz at 3.01 g/t Inferred, plus silver resources of ~1.4Moz at 11.2 g/t Indicated and ~1.2Moz at 9.5 g/t Inferred. In AuEq terms this works out to ~647Koz at 5.08 g/t Indicated and 407Koz at 3.16 g/t Inferred. The bottom line is that MSV's Fuwan and Changkeng resources together work out to around 200 million ounces of silver and half a million ounces of gold, so far. Unravelling Asian corporate structures with cross ownerships can be tricky, but from an operational and marketing perspective the Changkeng deal simplifies development of adjacent silver and gold deposits together under one umbrella instead of two associated but separate companies. I am also looking at MMM, which owns 11M shares of MSV, as a possible backdoor into Minco Silver. MMM's December 2015 balance sheet shows no debt, ~C$5.6M cash, plus ~C$4M in marketable securities (which I presume are MSV shares now worth ~C$13.4M). In other words at C$0.41 per share MMM's C$20.8M market cap compares to C$19M in cash and MSV shares held, which provides no discount to just holding MSV shares unless you also value MMM's exploration plays. The feasibility study (FS) is a few years old and needs to be updated with Changkeng's gold resources. Some highlights are a 3K tonne per day operation over 9.2 years, with a decent 91% mill recovery, producing 5.5 million silver ounces per year at a low US$5.65/oz cash cost, resulting in a quick 2.3 year payback and robust 33% IRR before tax. Total revenue is US$648M with almost half or US$310M in operating cash flow, or US$111.5M NPV at a 6% discount. These are based on only US$13.57/oz silver which may show a substantially higher net present value at today's US$17.11/oz. So why has MSV dragged along its decade lows at under C$0.60 a share over the past year, until a month ago, with such a positive FS that should be financeable even at silver's lowest price this year? China is the world's largest gold producer and second largest silver producer, but some argue that its bureaucracy should be avoided. I say no more than most other non-Americas countries as mining transactions do get done, such as (NYSE:EGO)(TSX:ELD) Eldorado Gold's US$300M deal signed two weeks ago to sell its Jinfeng mine. (TSXV:SGC)(OTCBB:SGCNF) Sunridge Gold was mentioned in our February 29 Tweet, Hot Sheet and our blog's weekend recap newsletter as a short-term arb-like play with a Chinese group buying SGC's 60% of the Asmara copper-zinc-gold project in Eritrea which offered a cash distribution significantly higher than SGC's price—which just closed. In any event MSV and MMM are audited Canadian public companies required to follow TSX rules. My February 22 article featured China's largest silver producer (TSX:SVM)(OTCBB:SVMLF) Silvercorp Metals after it bottomed at C$0.60, now C$2.62 after touching C$3.10 on April 27—over a five bagger in just three months. As a developer MSV is not yet producing but has similarly large high-grade silver deposits, and now high-grade gold which is what first caught my eye last summer. Here's the really good part! At first I assumed MSV's mine must also cost a fortune to build but to my surprise pre-production mine capital costs are only US$73.1M plus US$8.3M in working capital. Cheap, but I bet MSV has no cash and a ton of debt; wrong, as of the end of last year MSV's balance sheet shows C$26M+ in cash plus C$32M+ in marketable securities and no short- or long-term debt. Shareholders equity is C$110M or C$1.84 per share (not including today's higher silver price or MSV's new gold resources) versus only a C$73M market cap at C$1.22 per share. Not only is MSV trading 34% below book, it has almost C$1 per share in cash (C$58M / 59.7M shares outstanding) to cover a good chunk of the US$81M CapEx costs. The balance sheet is clean and could easily support some debt, or a combination of the financing options mentioned earlier, at least until the share price and market cap is sufficiently higher than equity before issuing more stock. At recent market lows you could buy mining shares that represent gold in the ground for ~US$10 an ounce. MSV now owns half of 1Moz-Au so if you subtract US$5M from its US$57M market cap, less cash of US$42M, and divide this US$10M by 200Moz-Ag it suggests the market is valuing MSV's silver in the ground at ~US$0.05/oz—only a nickel an ounce silver! With such ridiculously low values I'll take a chance on China and I'd be surprised if MSV is not already on a few takeover radars. My bet is that MSV wants to avoid debt or expensive dilution and may simply wait for US$20+ silver again, and will grow resources and finance its mine as share prices move closer to previous highs. This is just a guess as it is hard to even read between the lines with both Minco's so quiet—their latest news releases were in August. MSV trades thin with a tight unpolluted share structure and is seriously under followed. I expect that may change as Minco Silver starts raising equity again, when brokers and analysts usually take notice and make recommendations after gorging at the financing fee trough. Producing miners regularly replace depleting resources either through exploration or M&A. Friday saw (NYSE:GG)(TSX:G) Goldcorp's C$520M all stock deal for (TSXV:KAM)(OTCBB:KMKGF) Kaminak Gold and its Yukon Coffee gold development project. All stock deals which closed in April include Africa producer (TSX:EDV)(OTCBB:EDVMF) Endeavour Mining's C$226M merger with (TSXV:TGM) True Gold Mining for its Burkina Faso Karma mine (first gold pour was last month), and South America silver producer (NYSE:TAHO)(TSX:THO) Tahoe Resources' C$945M deal for (TSX:LSG)(AMEX:LSG) Lake Shore Gold and its two producing Ontario mines. I also followed (TSX:KGI)(OTCBB:KGILF) Kirkland Lake Gold's C$178M deal for (TSX:SAS)(OTCBB:STADF) St Andrew Goldfields and its Holt and Holloway mines and Taylor project, which closed in January. The majors seem only interested in high grade, low cost, late stage development projects (or already producing mines) as small profitable bolt-on transactions to be paid for in paper. But watch how small and safe turns into big, risky deals all over again as capital, egos and appetites grow with gold prices. These short company videos are informative and high quality: Exeter Resource 3D Caspiche model, Chesapeake Gold Metates project, Northern Dynasty Minerals Pebble project HD, Minco Silver 3D Fuwan model and International Tower Hill Mines Livengood project. Our friends at Palisade Research cover some of these stocks in an insightful article last month called, The Power of Optionality: Making 150% In Four Months.